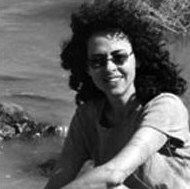 Marcia Golub has published two novels and a book on writing (Secret Correspondence, Wishbone; I'd Rather Be Writing), as well as poems and stories that have appeared in Narrative Design (anthology), Contemporary Rhyme, Blueline, Ars Medica, and Caution Horse. Her unpublished novel TALE OF THE FORGOTTEN WOMAN was nominated twice for a Pushcart Press/Editor's Award as well as a PEN/Nelson Algren Award. She teaches at Writer's Voice. while I looked out the window, saying kaddish for you. beyond my vision, while I thought of you.